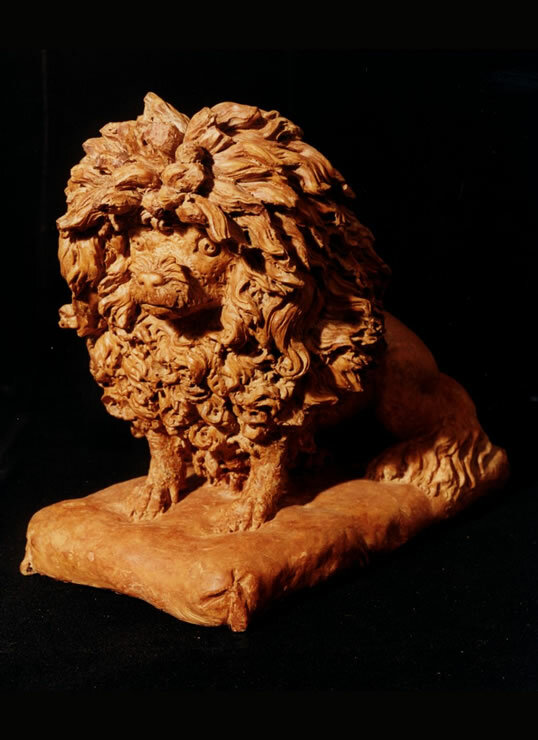 Late 18th century terra cotta sculpture of a poodle with a "lion" haircut seated on a pillow. The sculpture is attributed to the sculptor Anne Damer. Horace Walpole, her long-time guardian, bequeathed Strawberry Hill to her. Anne Seymour Damer was famous for her animal sculpture, and her dog sculptures, really portraits, show many similarities to the present piece. She paid great attention to the dog's fur, the eyes are domed, and they sometimes appear on a naturalistically carved pillow. She worked in terra cotta and marble. She was buried with her sculpting tools and the ashes of her favorite dog.